I LOVE Bova’s in the North End and I am thrilled I don’t have to drive in to Boston for Whoopie Pies. We had the Prosciutto Panini – it was HUGE and a bit salty – but DELISH! Hubby and I split one and it was plenty big enough. 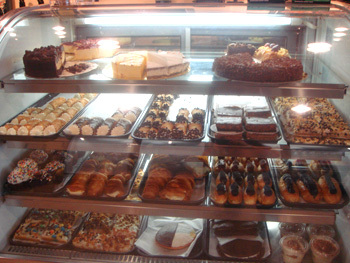 Between Bronzetti’s and Bova’s we have a great selection now!! When are you going to Samba’s for a reivew? Go on Saturday night for Kareoke! Thanks for yet another great review, Michelle. HOW IN THE WORLD DO YOU DO IT??? It’s amazing to me that you not only run around but also can sample stuff for us. You’re so great to have this blog. Thanks for everything that you do for Framingham! this doesnt have anything to do with north end treats, but i heard on the radio today that Chilli’s on rte 9 is closing and The British Beer Company is moving into that location. Is there any truth to this???? We were excited to try it out, but when we went in they said it would 40 minutes for a pizza. My wife and I were a little taken aback, but we asked for a menu to take home (we did not have the time to wait). But they were out of those. There seemed to be alot of people behind the counter frantically pulling things out the oven. I am not so sure they knew what they were doing. I hope to try it out once they have the place running smoothly. 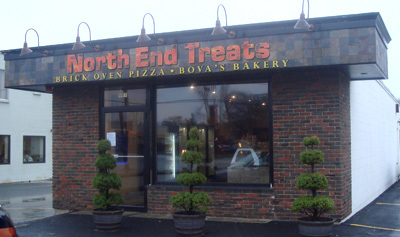 I have been to North End Treats several times already. Their pizza is my absolute favorite in terms of quality and variety. It’s delicious! Also their gelato and desserts are phenomenal. In terms of the long wait mentioned above, I recommend calling ahead. Their number is 508-620-6836. I ordered 8 complicated-flavor pizzas from there last weekend for a party and it only took 30 minutes. They really do run a smooth show, but they’re already popular so it can be busy behind the counter. I can’t say enough good things about them. i was at Colleen’s party (small world) and fell in love with this pizza and went back the next week for more…not Colleen’s but NET’s. they had my pizza done in 10-15 when i called ahead. the impulse buy cannolli was awesome too. I highly recommend! We had some pizza night before last and it was NOT GOOD. We’re a little worried, because we’d had it one time before and thought it was great. But our last time the pizza was doughy and underdone and a little wet, with weird overly sweet pickled bell peppers on it (like gherkins). We ordered just green peppers and were unpleasantly surprised by the very bad, sickeningly sweet taste. Again, we loved what we had before, so I know what you all are raving about. At least I can give you all a word to the wise: don’t order the green peppers unless you want a sickly sweet pizza. Also, it was chaotic when I picked up the pizza too. Maybe that’s why the the pizza was so disgustingly underdone. 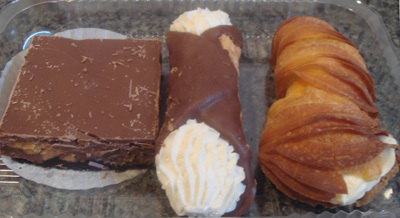 We’ll take a little break and head back to Gianni’s before trying North End Treats again. We decided to try NorthEnd Treats today. The caramelized onion pizza (personal size with thick crust) was incredible. The four cheese pizza was okay — the cheese combination was bit on the sharp side. We also tried cannolis, a lobster claw and a chocolate peanut butter square — these were all amazing. We’d love to go back for gelato — but the posted prices are very expensive, so we’ll stick with Mad Willies. Look forward to trying it again soon. I have been there three times and the pizza is excellent. Very friendly staff, every time I have been in there the place seemed to run smoothly. There was no wait and the pizza was cooked perfectly. I look forward to going back! we dropped in this weekend to check it out. 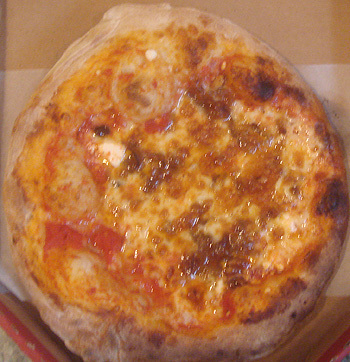 got a slice of pizza which was good – figured if we got a fresh one right out of the oven it would be even better. also tried a chocolate chip cannolli and an eclair and they were awesome. nice to know there is a great bakery without having to go to the north end!! Visted there a few times, excellent every time! I told the guy at the counter that the place needed to be bigger since they were so popular! He said during the summer they’ll put tables out front, and then thought for a minute on how they should have bought Franco’s place next to Walgreens. I couldn’t have agreed more. Yeah for the little place, the great food and fantastic service! Really lousy service and they have no clue how to run a pizza shop. Waited over 30 minutes and then the “broke my pizza” whatever that means.. Would never go back…rude and again totally clueless.. I was there getting food when you blew up and threw your receipt at the poor girl behind the counter…really uncalled for. This is a new business so they probably have some quirks to iron out. It’s too bad you over reacted because it is a great place with great food. Great blog. Would you mind terribly if I put a link for your blog in mine? Just moved to the area and thought my readers would like to read a bit about where I live now from someone else… No problem if not. Oh, and I’ve heard good things about this pizza place from co-workers. It is obvious that some of the people that work there or the owner is pumping up this place with some of these comments. “I recommend calling ahead. Their number is 508-620-6836. I ordered 8 complicated-flavor pizzas from there last weekend for a party and it only took 30 minutes. They really do run a smooth show” Give me a break! My wife and I have been there a couple of times. Seemed to us like they were shipping in the day old pastries from boston and hawking them off on us. Not very fresh. Will try the pizza in the future. Had the pizza and it was really good. The tiramisu was good. I agree somewhat with the comments on the service: I ordered a small plain cheese pizza and wasn’t told when it was done even though I was there waiting. I watched someone bring out pizzas for another customer that was waiting so I assumed that the same would be done for me. I wonder how long I would have had to stand there before being told that my order was ready. Mmmmmm. 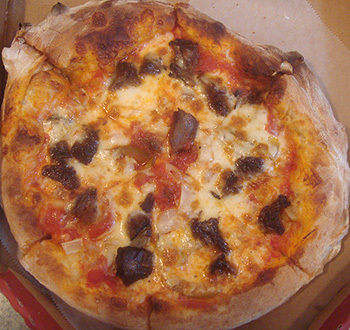 North End Treats is without question the best pizza around. Gianni’s is also very good. 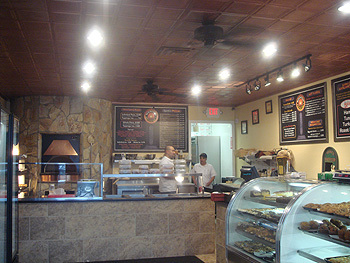 The pies are tasty, quality ingredients, looks like the same guy who owned the old Max Muscle supplement shop on rt 9.